Explore the pleasures of wine with the experts from an award-winning wine school! There is no more inspiring place to buy, drink, or study wine than at Berry Bros & Rudd’s historic building in St James’s, London. And now the firm’s internationally renowned school offers their class in book form. Whether you’re a newbie or looking to enhance your experience, Exploring & Tasting Wine gives you the tools to recognize, remember, and enjoy wine. It helps you answer such questions as: Why do I like this wine, not that one—and how can I use that knowledge to find other wines I’ll enjoy?Why does this wine work with that food? What about organic wine? Biodynamic wine? Natural wine? Featuring a foreword by actor and author Emma Thompson, a former Wine School pupil, the book focuses on the classic grape varieties and features groundbreaking graphics that describe vital factors such as aroma, flavor, and balance. Background pages broaden your understanding of wine and its components. 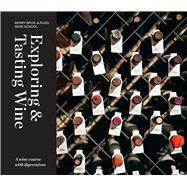 This is not a book for wine snobs, it simply helps you answer the most pressing question of all: Is it good to drink? Berry Bros & Rudd is Britain’s oldest wine merchant and still family-run. The firm has been trading from the same shop at No. 3 St James’s Street, London near St James’s Palace since 1698, and has been serving the royal family since the time of George III. Over three centuries later, with two Royal Warrants and eight Masters of Wine, the family business continues to flourish. It was the first wine merchant to begin online sales, in 1994, and its award-winning Wine School courses, held in the historic Pickering Cellars below the shop, have been running since 2000.